March was typical with some very nice days and some windy days. The water is still cool but slowly warming. 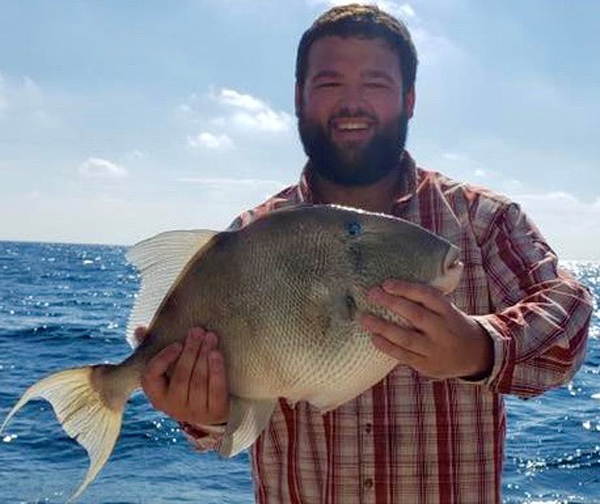 Triggerfish are biting along with vermillion snapper. The better bite has been 20 miles offshore and farther. Spanish mackerel should appear along the coast any day. April will provide many more opportunities. April is a great month for fishing the Alabama Gulf Coast. The water temperature should increase. This will make fish more active. We are hoping triggerfish will remain open through the end of May. Cut squid on small hooks is usually you best option to hook triggers. The same bait will work for vermillion snapper. The season for red grouper and scamp grouper will open April 1st.These fish are usually found in 180 feet and deeper around natural hard bottom. Live bait is always the best option. It appears that amberjack season will be open during the month of May. Gag grouper season will open June 1st. Red snapper season for federally permitted charter boats opens June 1st with the last day on August 1st.This season is open 7 days a week. The 2019 Alabama red snapper season for anglers fishing from a private vessel or state-licensed guide boat will be three-day weekends (Friday-Sunday) from June 1 through July 28, 2019, including Thursday, July 4, according to the Alabama Department of Conservation and Natural Resources (ADCNR) and N.O.A.A. Fisheries. Except for the opening weekend, which begins on a Saturday, weekends are defined as 12:01 a.m. Friday through 11:59 p.m. Sunday. This season only applies to those who do not hold federal for-hire fishing permits. The new fishing seasons vary from state to state. Be sure and check your state regulations prior to fishing.